(Directorium humanae vitae, in German.) Translated by Anton von Pforr. First edition of the Fables of Bidpai. – In a contemporary binding by Johannes Zoll. 290 x 210 mm. – 126 leaves, with 125 (of 128) half-page woodcuts, four of which coloured by hand. John of Capua's Latin translation of the Directorium humanae vitae (Fables of Bidpai), is an intriguing piece of world literature. Ultimately traced to Buddhist teachings, these fables are said to originate in a famous collection of Hindu tales, the Pañcatantra. Many of the fables are the roots of familiar and, often enough, very entertaining stories. Most amusing are those of occurrences in human life, from which rather unexpected morals are often drawn. Some are also known from collections such as Aesop's fables. Among western literature influenced directly by John of Capua's version are the Gesta Romanorum, Boccaccio's Decameron, and La Fontaine's Fables. Anton von Pforr (d. 1483) translated the Latin fables into German in the 1470s. The edition at hand is the very first edition of the Fables of Bidpai. 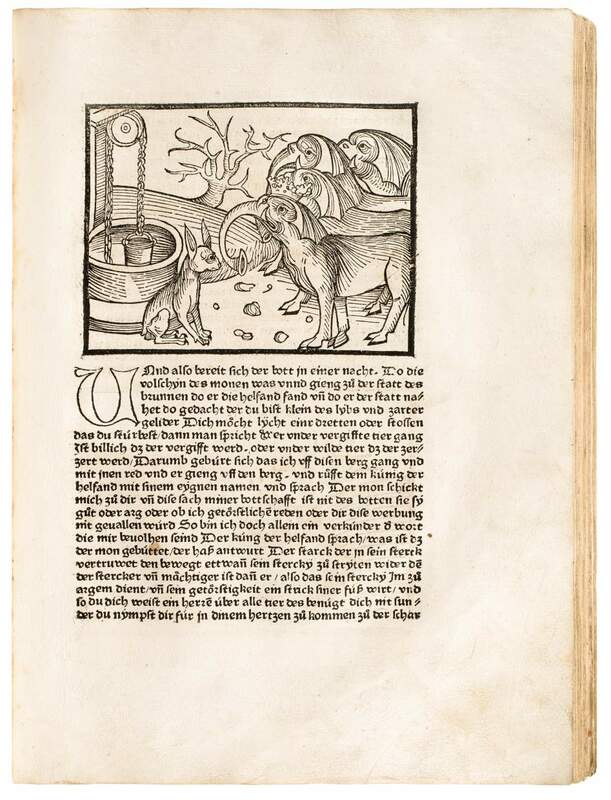 In fact, seven German editions appeared before the first Latin one (c. 1489). It is illustrated with 128 impressive woodcuts from 126 blocks. Vivid, powerful, and comical, they were most probably executed by a very talented artist from Ulm.